Whether you’re looking for a new branded jacket for your business or after new sports apparel for your association, the Stencil Men’s Hoodie is a cost effective, yet great choice. These hoodies are made from 100% polyester lightweight Cool Dry fabric, and with the classic hooded style, the Stencil is a popular choice. 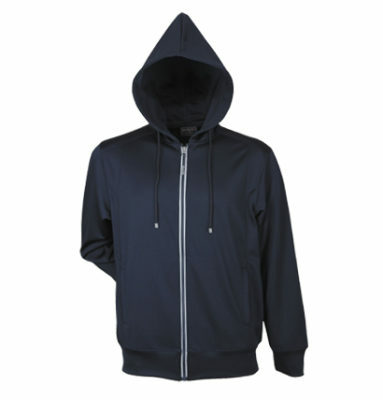 The Stencil Men’s Hoodie features elastic cuffs and hem, drawstring hood, reflective piping on the zipper to improve visibility, and zippered pockets. There’s also a small internal security pocket, big enough for a mobile phone. The Stencil Men’s Hoodie comes with a screen print or embroidery option for your logo or branding so that you can choose the best option for your business or sporting association. Ranging in sizes from small to 3XL, the Stencil Men’s Hoodie is breathable, easy to care for, quick drying and features yarn-treated moisture wicking. Team with the Women’s Stencil Hoodie for a great cohesive look across your business or sports association.